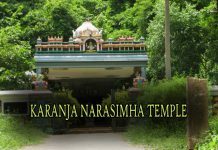 The temple is located at a distance of 90 km from Kaninada, 50 Km from Rajahmundry and 25 Km from Amalapuram. In the past this pilgrim center became famous as one among the pilgrim centres of Bhima Mandalam. This pilgrim center is at present in the village called Palivela in the Kothapeta Mandal of East Godavari District, Andhra Pradesh. The idol installation of the Lord was done by Maharshi Agastya. The Lord here is being called Sri Uma Koppulingeswara Swamy. This pilgrim center is in the route between Rajahmundry and Amalapuram near kothapeta. In the past when Maharshi Agastya was performing Tapas on the bank of the river Kowsiki near Palvalapuram, the Kalyana Mahotsavam of Parvathi & Parameswara was taking place for the good of the world. Agastya wanted to witness the kalyana Mahotsavam. Before performing Daksha Yagna Daksha Gods like Indra who were on the mountain of Himavat were afraid that if Agastya came to witness the Kalyanotsavam, pralaya would take place. The Lord fulfilled the wish of Agastya. No where can the Lord Parameswara be seen on Ekapeetam with Parvathi as here. Later this pilgrim center became famous as Lolla Agasteswara Swamy pilgrim center. The Lord began to be called as Koppulingeswara because he wore hair around his head. In the library of Sri Vidyananda at Pithapuram it was found that there was a lesson on the Talapatras. During the time of Srinadha at Palvalapuram the lord was called Agastewara. Srinadha wrote Sloka also.During the time of Sri Pratapa Rudra (Salivahana Saka) repairs were made to the temple as declared by the Sasanas. In the past the Turks attacked many Hindu temples. They cut off the head of the beautiful Nandi. The head was later deftly installed in its place. In the past a Velanati priest was performing daily pujas to Lord Agasteswara installed by Maharshi Agasya with great devotion. The priest had a concubine. The people angered at this, complained to the king. At first the king ignored the complaint. As the complaints grew, the king one day came to inspect the temple at Palvalapuram. The priest was not in the temple at that time. On coming to know of the king’s arrival, the priest hurried to the temple, to greet the king. As there were no garlands (Nirmalya) in the temple, the priest secretly brought the garland in the hair of his concubine and offered it to the king. But the people assembled there, didn’t believe the words of the priest. They said something was fishy. Then the King ordered the priest to pluck a hair of the Lord and show him. The priest did so. The King could see blood on the plucked hair. Immediately the King lost his eyesight. He realised his mistake and prayed Lord to pardon him. The benevolent Lord immediately took pity on the King and restored his eyesight. The Nerjoyed King praised the Lord and immediately offered a village called Juthugapadu under his rule to the Lord as his manya. (At present Juthugapadu is in Ravulapalem Mandal, 1 Km from Podagatlapalli village). Even to-day one can see the magnificent Linga of the lord with hair around it in the sacred temple of Sri Uma Koppulingeswara at Palivela village, Kothapeta Mandal, East Godavari District of Andhra pradesh. 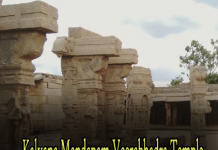 The state Archeological Department registered Five monuments (Rajagopuram, Swamivarimandapam, and some statues on pillars etc) the same was exhibited in front of entrance gate of the temple. Kalyana mahothsavam Lord Sri Uma Koppeswara Swamy Kalyanam. Palivela Dharma Satram. Contact:Person-in-Management, Palivela Dharma satram, Palivela kothapeta Mandal, East Godavari District.